Our standard products are designed to MILSPEC product qualification and to work in a myriad of applications, including ground, surface, and airborne systems. The standard environmental specifications for our products include a wide temperature range (-40°C to 85°C), operation to 30,000 feet altitude, humidity up to 95% noncondensing, and a vibration profile of 0.04 g2/Hz power spectral density. These specifications meet the vast majority of customer requirements. Further, by not testing to the extremes of the military standards, we are able to keep the cost of our products low. However, there are times when it is necessary to meet certain standards. At NuWaves, we have the expertise to provide that compliant product. 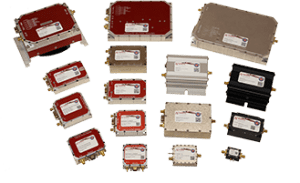 Through many years of supporting the warfighter in all branches of the Armed Forces, we have designed, developed, manufactured, qualified, and fielded RF electronic hardware. This hardware is currently flying on military jet aircraft and helicopters, as well as surface ships of all sizes. To make this possible, the hardware had to meet the stringent requirements of military standard environmental (MIL-STD-810), electromagnetic interference/compatibility (MIL-STD-461), aircraft power characteristics (MIL-STD-704, and shipboard electric power (MIL-STD-1399). 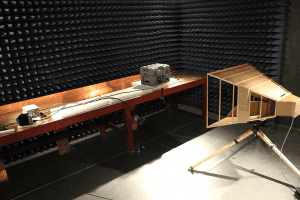 Our in-house test assets include an RF anechoic chamber, vibration and shock table, aircraft and shipboard power test equipment, and temperature/humidity chambers. For highly specialized tests, such as high-altitude testing, salt fog, or extreme shock and vibration, we have strong relationships with a number of industry partners that have the equipment and expertise to perform these tests. Figure 1. Our in-house test capabilities and expertise ensure we meet our customers’ expectations for rugged RF electronic hardware. 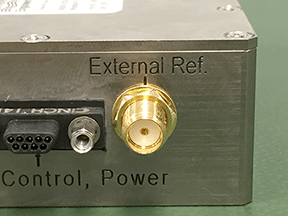 At NuWaves, our purpose is to provide the U.S. Military with one-of-a-kind RF solutions. For our customers requiring military standard testing or product qualification, we offer a full spectrum of solutions to meet the needs of their systems. If you need a qualified standard product, or need assistance qualifying your RF system, we are here to advance your mission. 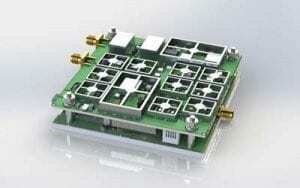 NuWaves…Trusted RF Solutions™. PrevPreviousHow do you keep noise out of RF circuit power supplies?